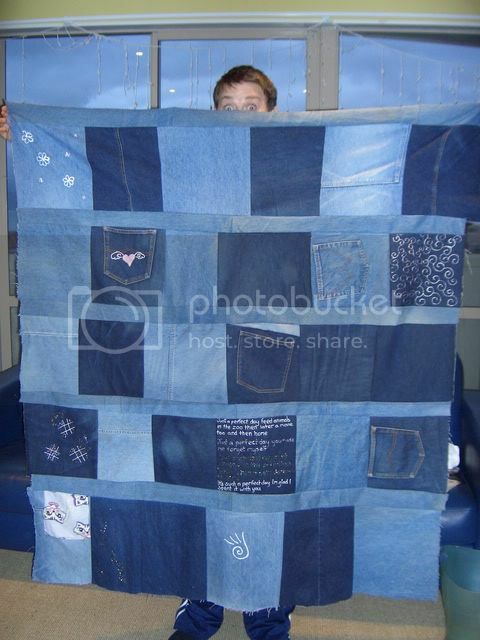 This weekend I assembled the top of my first jeans quilt. It was fun and not as hard as I thought it might be. I finished it this afternoon. It looks like this when Lee holds it up and peeks over it. I am very very pleased with how it looks and can’t wait til I get paid again so I can buy batting and backing and make it into a proper quilt. Still trying to decide what to back it with. I want something heavier than a sheet. Polar Fleece would be very warm so that’s tempting, but maybe something a bit waterproof so it’s a good picnic blanket? I’ve also done a bunch of scrapbooking pages which makes me feel happy and virtuous. It’s the sense of accomplishment that makes it virtuous I think. Watched Tokyo Godfathers last night which I liked immensely. Although I think it’s a bit maudlin for me to want to watch over and over. Now, off to sit in front of the heater. Is anyone else concerned about the ice age that’s hit Wellington? The thunder and lightning yesterday was way cool, and I loved the intense rainbow on Saturday afternoon but the cold I can’t handle. I need warm!